Aimee Louisanne and a friend (aka, “lunch”) get rather close to a T-Rex from Dinosaur Zoo Live. Photo by C. Waits. Dinosaurs from Australia are invading the United States via Canada. Yes, you read that right. The Land Down Under has sent its toothiest specimens to delight America’s children, just as soon as they’re done devouring Canada’s. Erth’s Dinosaur Zoo Live [sic] reaches the Ordway Center for the Performing Arts in St. Paul on Tuesday, February 13. The family-friendly show features realistic dinosaur suits, an array of dinosaur puppets, and professional paleontologists serving science facts in an entertaining and accessible format. 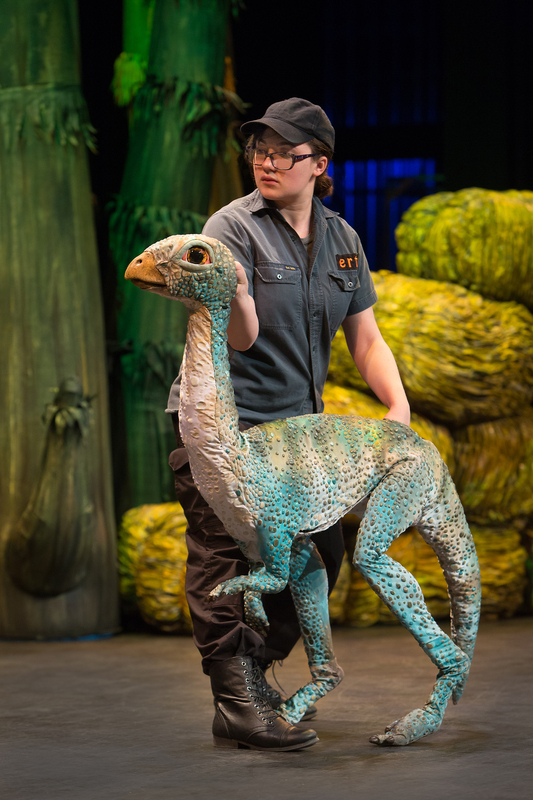 Although you might not expect it, Dinosaur Zoo Live comes to town via the same production company behind A Night with Janis Joplin, which landed at the Ordway two years ago. The two events produced by Red Tail Entertainment are entirely different in feel and audiences, although children are likely to find the dinosaurs just as electrifying as audiences found Mary Bridget Davies’ vocals in the Joplin show (i.e., very). Aimee Louisanne with Titanosaur and friend at Dinosaur Zoo Live. Photo by C. Waits. Dinosaur Zoo Live was first conceived by Erth Visual & Physical of Sydney, Australia. 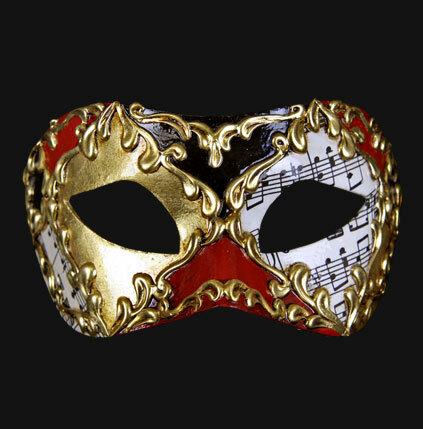 An incubation period later, it hatched at the Adelaide Fringe Festival in 2014 with the force of a volcano erupting. By the time the festival was over, the show had been voted Best Children’s Show, triggering what has become an intercontinental dinosaur migration. One of the show’s standout features is that it allows children to get up close and personal with the dinosaurs, showing off their scale and unique patterns of movement. The show’s fantastically detailed creature designs and curated setting are the handiwork of show designer Steve Howarth and specialist puppet designer Bryony Anderson, and brought to life by a team of expert puppeteers. The result is an experience 65 million years in the making, but fun and easy to digest. Kelley Selznick and Leaellynasaura in Dinosaur Zoo Live. Photo by C. Waits. 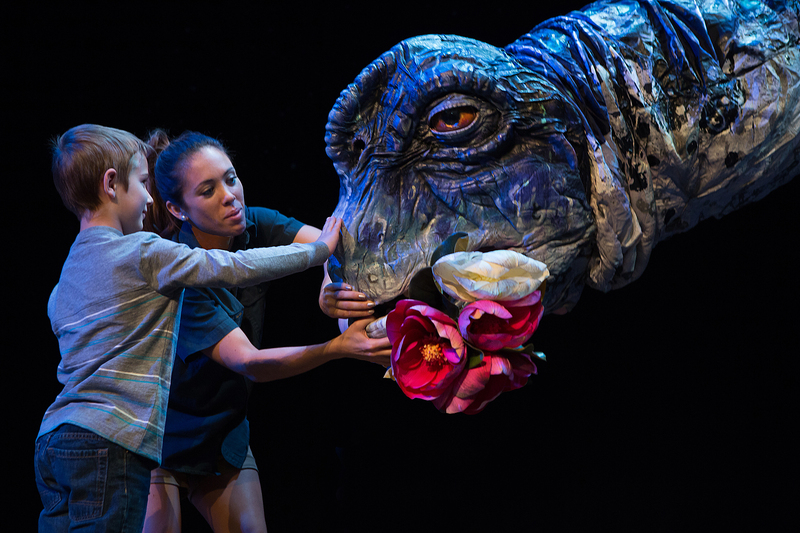 Erth’s Dinosaur Zoo Live plays at the Ordway Center for the Performing Arts in St. Paul, MN on February 13 at 7 PM.